Description of "The Power of Self Discipline"
Do you often find yourself struggling to resist your unworthy temptations? Does every little distraction drift you instantly from your most important task? Do you always wonder how high performers manage to control their impulse and stay focused on their goals? Do you think every successful person is born with innate self-control abilities? Imagine if you could resist any temptations and race like a horse with its blinkers on. Imagine having a vast reservoir of willpower to handle difficult things smoothly. The Power of Self Discipline will help you truly understand the underlying reasons why people succumb to their instant gratification, despite being rational humans. This book will equip you with actionable strategies to strengthen your willpower. You will learn habits and routines backed up by neuroscience and psychological researches conducted by top self-control experts to improve self-control. Learn the psychology and economics of why Chimpanzees demonstrate better self-control than humans & what to do about it. Why False Hope Syndrome seriously destroys your dreams, and how you can overcome this? Identify the psychological factors that drain your willpower without you knowing it. Learn why a rational human being chooses one single reward instantly, when he can get double in two minutes? How What-The-Hell Effect drowns you deeper into your indulgences, and the ways to control it. Leverage the power of our Prefrontal Cortex’s three part structure to boost your willpower. How “Energy Budget Model” governs your behaviour and ways to optimize it. How Using Commitment devices enables you to stay disciplined. The neuroscience research supporting the mindfulness techniques to get rid of any bad habits. Strategies to avoid emotional choices and make rational decisions. Mental Toughness Tenets of Navy SEAL- learn to develop your grit and self-control. How 4X4 breathing technique can help to you immediately regain your calm even during highly stressful situations. Learn How simple mindfulness based techniques can calm your mind, reduce stress and help you quit any bad habits. Self-discipline is the key to execute most difficult tasks and sets apart achievers from the ones who remain in mediocrity for life. Don’t settle for mediocrity, as you can achieve whatever you want. Som Bathla loves to research human psychology & behaviour in order to get maximum out of life. He is always eager to learn, embody and then impart the fundamental of optimal living to help others lead a resourceful life. He has written multiple bestseller books on topics about how to transform your mindset and enhance performance to get better and faster results. He is deeply convinced about the vastness of the human potential and is dedicated to teaching the ways to overcome self-doubt and fears, unleash the true human potential and thus enable one to take massive action through principles backed by psychological research and scientific evidence. 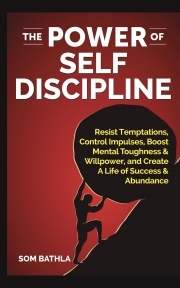 Reviews of "The Power of Self Discipline"